Oh, how I love new places, new tastes and smells and sights and sounds. Just this year, I have discovered hot, amber sabia chiles in Tucson, peaceful historic beguinages (cloisters) in Bruges, the warm chartreuse water of Kanaka Bay in British Columbia, the mind-bending apocalyptic canvases of John Martin in London. While we’re admiring the snazzy glamour of new discoveries, let me bring on stage the simple wonder of happy returns. It was while visiting Tucson last week, dipping into the pool at dawn with my wife Leslie, that I had second thoughts about the siren song of newness. Not second, exactly; call them revisionist or retrospective. I was enjoying something I have often done before, in the exact place I had been many times. Hundreds of times, in fact, have I slipped into this exact pool, which is framed by subtropical plantings and the stern, cactus-clad heights of the Santa Catalina foothills behind, burnished by the fierce, loving sun of the Sonoran Desert. A morning breeze feathered the mesquite fronds of the desert woods just yards away. A hummingbird buzzed by. Spent bougainvillea blossoms laid their vermilion origami on the surface of the water. A Gila woodpecker whacked a roof tile. The summer-warmed water was 85 degrees, both cleansing and comforting. Tendrils of overnight thundershowers curled by nearby escarpments, and the monsoon humidity lent the air a silken touch. “Doesn’t this feel like Tobago?” asked my wife. We were firmly into summer, which is a sweet time here in the Pacific Northwest. I don't travel much outside the region during this short season because not too many places can call me away from the relaxing warmth of the sunny days and the stimulation of the cool evening breezes. I love hiking and walking in summer, and the Pacific Northwest is scenic poetry. Just a few blocks from my home there is a short trail through Titlow Park where I can escape for an hour or two when longer hikes are not practical. 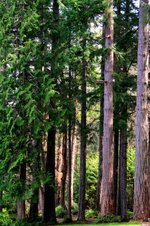 The walk leads down to the waterfront of Puget Sound through a small patch of old-growth forest and a larger area of secondary growth. It ends up at a good fish and chips place with a great view of the waterfront, of the twin suspension bridges across the Tacoma Narrows, and of the hills and trees of the Kitsap Peninsula across the Sound. This is the only time of year when sun and shade have much temperature relevance. The shade of the forest provides relief from the bright sunlight and reflected heat of the surrounding neighborhood like a cool, wet cloth does in a dry sauna. The meandering trail evolved from a gravel logging road, active from the late 1800's until the 1930's. The weathered foot hills and cliffs bordering this part of Puget Sound consist of huge deposits of gravel left by retreating glaciers. Loggers only had to scrape away the accumulated detritus of the forest cover to build a road. The evolved path I walked is more spongy now than crisp and crunchy. Leaf litter, tree needles and tree bark from the better part of a century have reclaimed the top foot or so. Incursions of shrubs and trees have narrowed the road into a trail that is only a little wider than one originally built for hiking. If it’s August, whales are suffering. I live on America’s Pacific Coast, a world-famous summertime visitor destination where hordes of ordinary, well-meaning people harass, torment and torture some of the world’s most charismatic wild creatures. The whales that ply our seas—especially the breathtaking, much-loved orcas of inland Northwest waters—wake up each morning, June through September, to the approaching howl of boat engines. They spend their days dodging a huge fleet of boats packed with googoo-eyed tourists who think they are at a Roller Derby match, an impression exacerbated by tour-boat operators who “honor” their so-called voluntary guidelines just like athletes do steroids prohibitions. 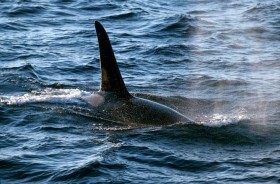 There are less than 100 Puget Sound orcas left. Holdovers from the days this inland sea wasn’t an exurban pond, they forage in waters fouled with urban runoff and toxic contaminants; they chase down remnants of our once-massive salmon runs, now reduced to trickles of minnows; they come up for air amid the whale-watch hordes to breathe clouds of engine exhaust. And, underwater, all day, they listen to unspeakable nonstop caterwauling. “Like a rocket ship taking off,” reports a Canadian scientific researcher who studied the noise impacts of whale-watching on the industry’s victims. He hung a hydrophone in the water and measured the decibels. Try to imagine life, 10 hours a day, with a hundred or so helicopters buzzing a few feet overhead. That’s what it’s like for Puget Sound orcas. rafting the Nooksack RiverPlanet Earth has areas so gob smacking beautiful, they captivate the humans living there. At any given moment, Bellingham Washington residents are hiking, biking, bird watching, fishing, river rafting, sailing, kayaking, skiing…. or sipping microbrews at funky pubs while planning their next adventures. With stunning mountains, wild rivers, mystical forests, and the beckoning Pacific Ocean, staying indoors is pretty impossible. “Every time I breathe this pure air, my life gets longer,” smiles Dylan Tougas, our Nooksack River guide.